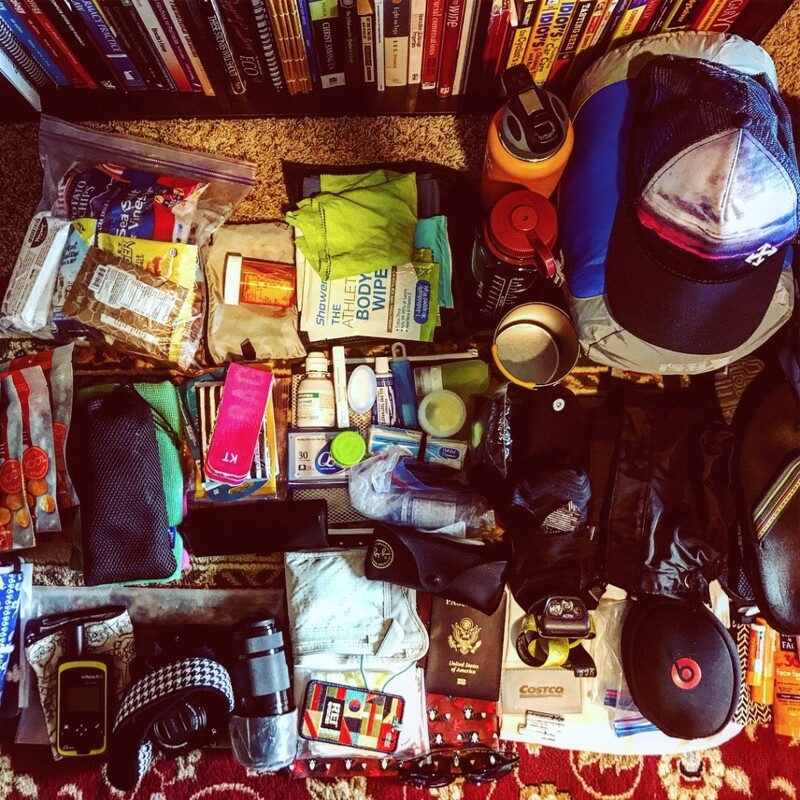 How does one prepare for the trek in just in one year? Starting in the summer, we researched different tour guides and groups. 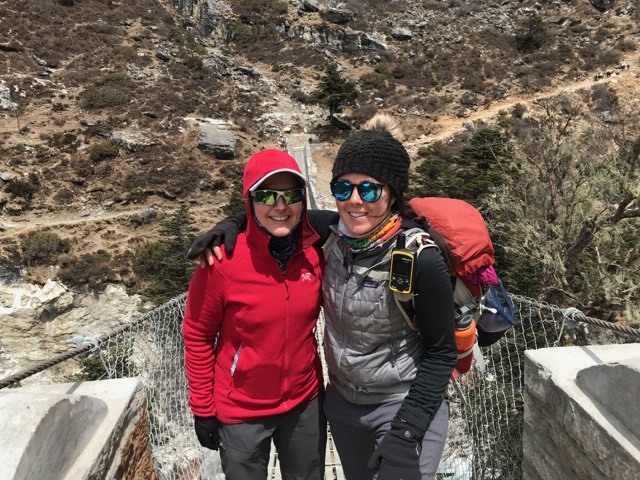 We chose a well-known tour group because they ensured that our safety was of utmost importance, allowed us to camp in both tents and tea houses, and provided Sherpas and staff to prepare our meals during the trek—no Dingboche diarrhea for this duo. Although altitude sickness can strike anyone, we read reviews for this particular trek that recommended a higher fitness level to decrease physiological stress of long-distance hiking at high altitude. Although there are many routes from the United States to Kathmandu, we chose to fly over the North Pole to United Arab Emirates then on to Kathmandu. Two days later, we arrived in Kathmandu, the capital city of Nepal (4600 ft above sea level). 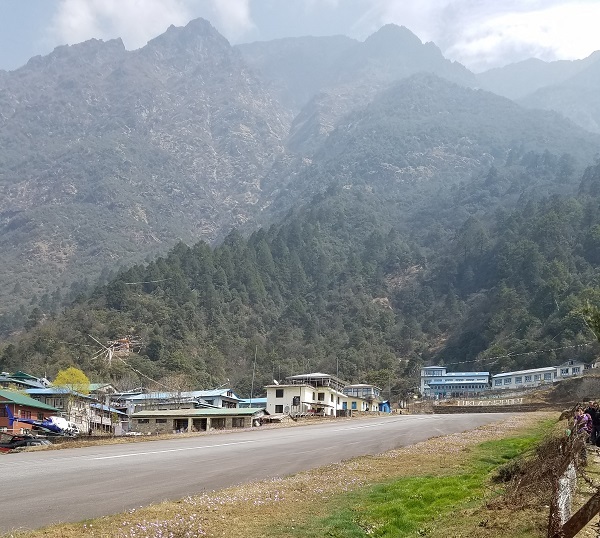 We toured the city for two days and began to take Diamox (acetazolamide) for altitude sickness prophylaxis the night before our flight to Lukla (9317 ft). 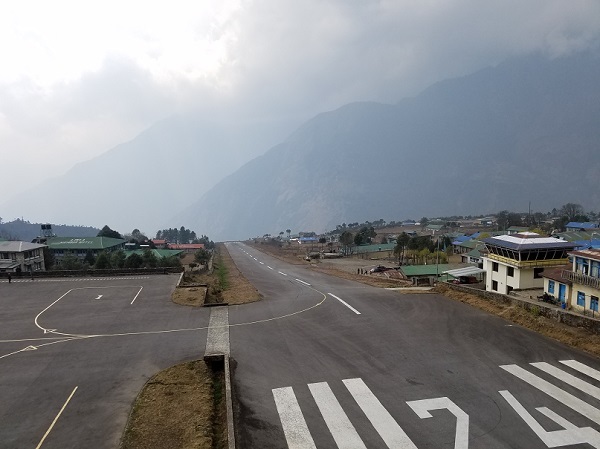 In Kathmandu our onward flight was cancelled due to high winds in Lukla, but we understood that the 24-hour delay was for our own safety and that of the crew as Lukla is considered one of the most dangerous airports in the world. This delay of one day, however, meant that a scheduled “rest day” (not really resting, but not trekking to a destination) had to be skipped, making it even more physically taxing. 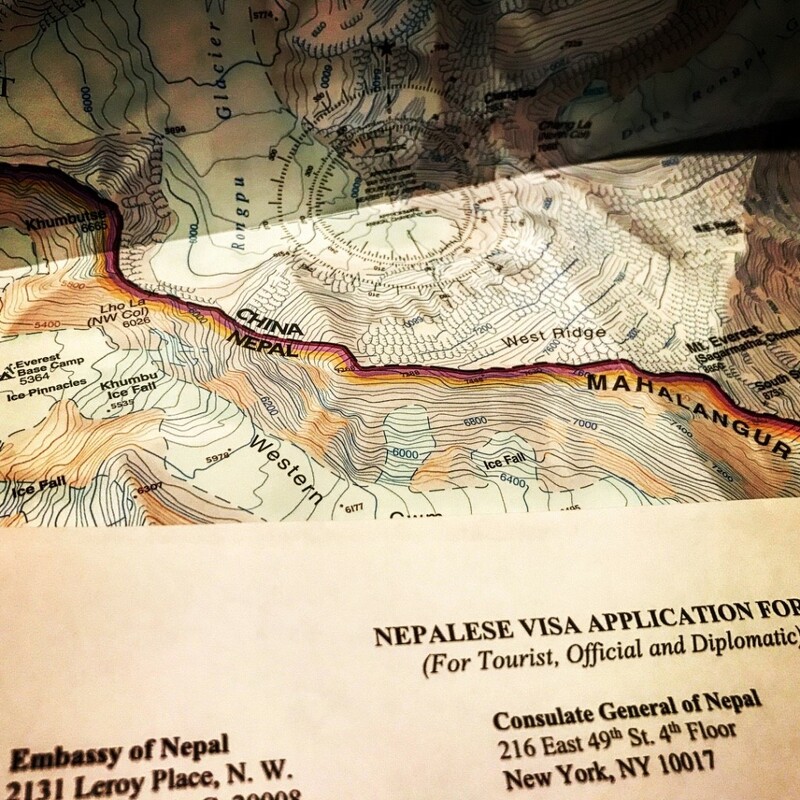 The next day, we were lucky to leave Kathmandu and begin our EBC trek with our 30-pounds of clothing, gear, food, toiletries, and excitement and energy. Our EBC journey began in Lukla (9317 ft). 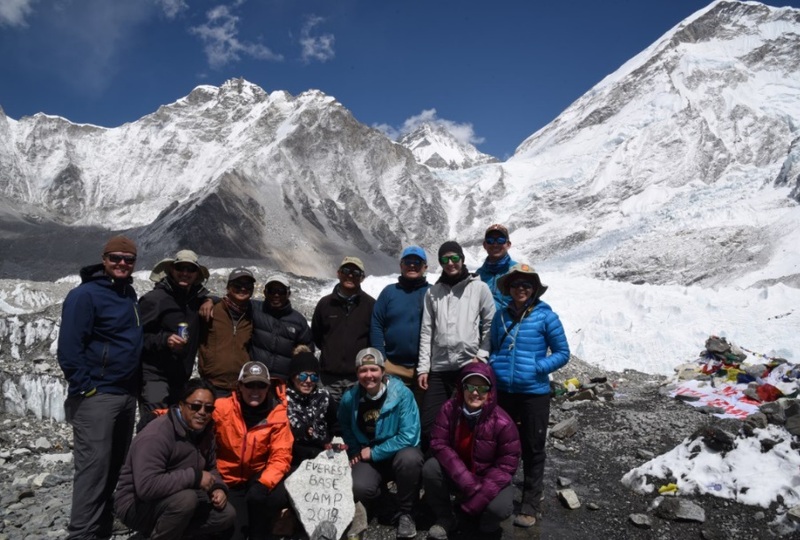 After a quick lunch in Lukla, our team, which included nineteen crew members (three Sherpa guides, kitchen staff and yak drivers), and a group of eleven individuals from Washington DC, Oklahoma, California and Washington state descended to Phakding (8562 ft). Our three main guides spoke English well and were very friendly and helpful. They shared much about their culture and region as we trekked. During our first night, we learned several Sherpa and Nepali words for greetings, numbers and food items. We slept in tents that first night across the river from Kongde Ri. 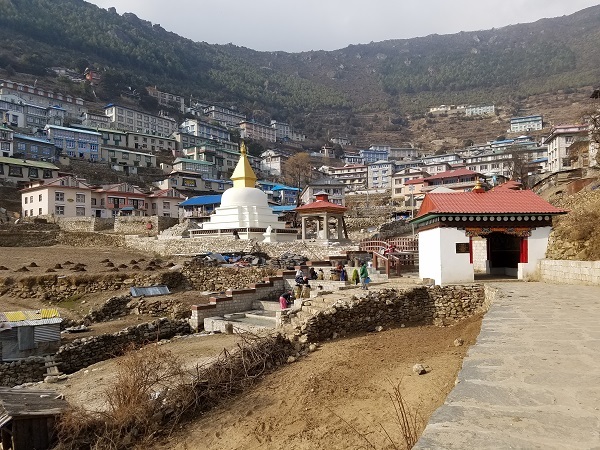 The next day we gained approximately 2000 feet in elevation as we made our big push to Namche Bazaar (11,286 ft), which is the main trading center and hub of the region. Anything we forgot to bring with us or could not fit in our packs due to the weight restriction of 30 pounds could be found in Namche, we were told by our guides. We loaded up on essential: Pringles, Snickers, and toilet paper. Yes, Pringles and Snickers were necessary items for the salt and calories. The toilet paper… well, that is obvious. By the way, did we mention that Diamox is a diuretic? The major concern of every venture is safety. We often walked at a pace of one mile per hour. At this speed, we had average heart rates of 120-130 beats per minute, which sounds bad but oxygen saturation was 98-99%; our bodies were compensating nicely to the altitude. We struggled at times to catch our breath, and our guides would wait. There was always one guide leading, a guide in the middle and a guide at the end. No one was left behind. Sometimes, we purposely lagged behind to ask our guides about their culture and history. Our team did not disappoint us when we arrived cold and tired into camp. Pringles, Oreos and hot Tang or Nepali tea awaited us as our “afternoon tea.” Yes, Tang can be made into a hot beverage. Surprisingly, Wi-Fi and cell phone service are available the entire way to EBC. 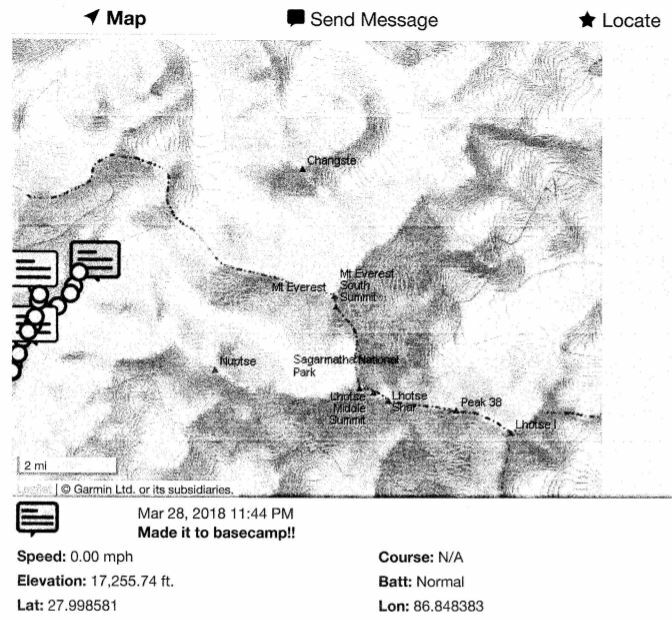 The cost of cell service seemed to be proportional to the altitude, rates increasing the higher we trekked. 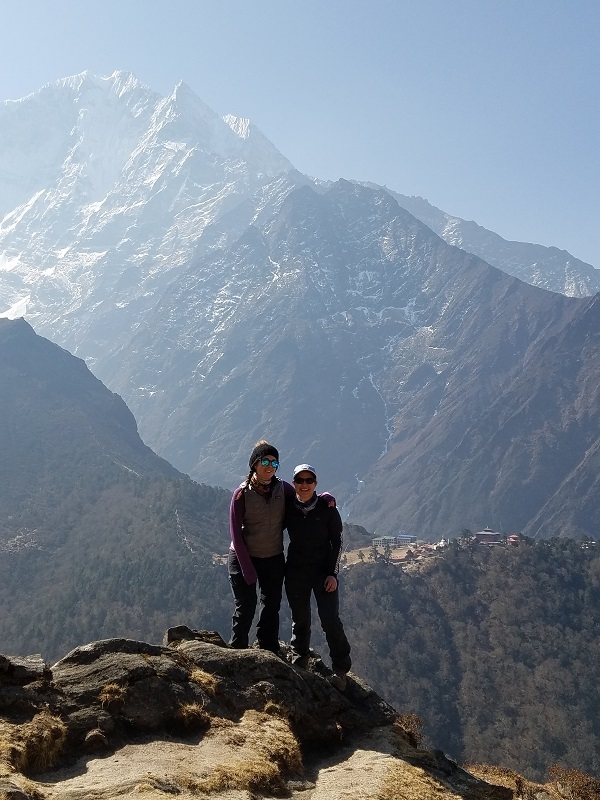 Following the “hike high, sleep low” philosophy for acclimatization, we hiked from Namche Bazaar to Everest View Hotel (13,000 ft) where we saw our first views of Mount Everest (29,029 ft), then back down to Namche - this was rest day #1. 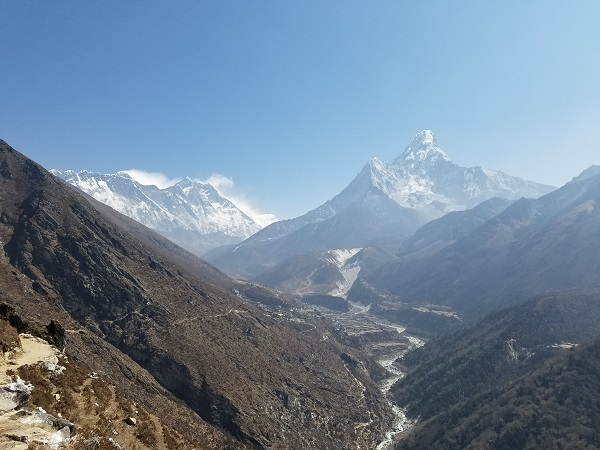 We also saw Lhotse (27,940 ft), Ama Dablam (22,349 ft). We slowly made our way to Phortse (12,500 ft), then on to Dingboche (14,468 ft) with another rest day. The mountain vistas were breathtaking… literally and figuratively. 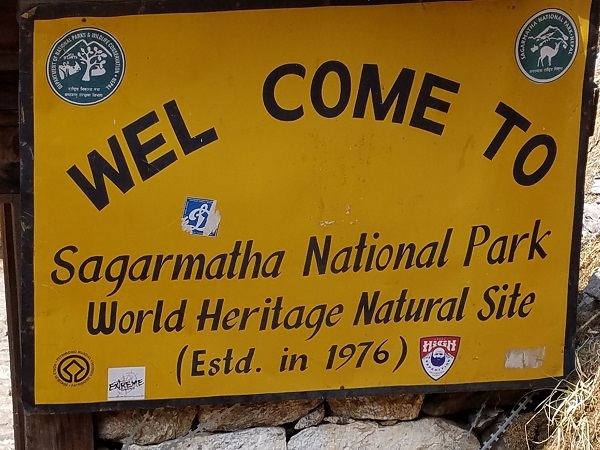 We hiked from Lobuche (16,108 ft) to Gorak Shep (16,863 ft), approximately 2.7 miles, where we dined on ramen soup, potatoes, vegetables, flatbread, canned fruit, Nepali tea and hot Tang. We rested briefly before hiking onward to Everest Base Camp. Our head Sherpa guide gave us a deadline much similar to the Mount Everest summit teams: “Arrive in EBC before 1400 or we will turn you back to Gorak Shep and you will not make it to EBC.” This was for everyone’s safety--weather could change drastically and rapidly, and it was a clear and very cold day in Gorak Shep. This ultimatum was concerning to Michele, who was fighting bronchitis. 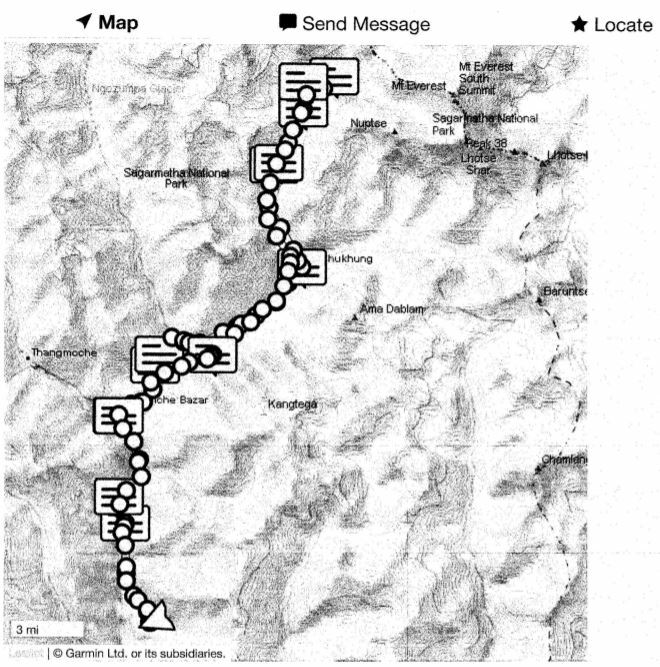 At about 1200, the team departed Gorak Shep and hiked 1.9 miles towards EBC. As we all hiked to EBC, the fresh snow crunched under our boots and several groups of yaks passed us bringing supplies to summit teams at EBC. The team stretched out into several groups as stronger hikers reach EBC first and slower hikers trailed behind. Frederike was a stronger hiker and reached EBC about 10 minutes before Michele. 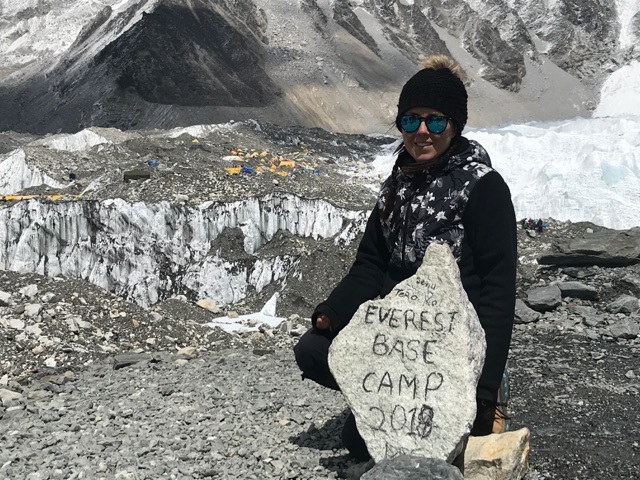 Michele paused at the downhill slope leading to EBC and told the head Sherpa guide that she could make it down but wasn’t positive she had the strength to make it back. He assured her that a Sherpa could help carry her pack and walk as slowly as she needed to accomplish her goal of getting to EBC. She met up with the team about 10 minutes later and stayed at EBC long enough for a few photos. 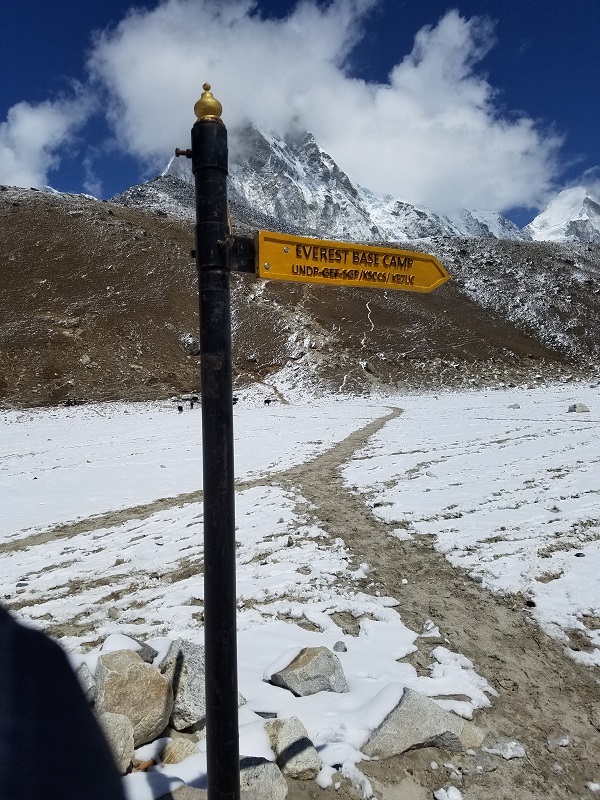 We arrived at Everest Base Camp with excitement and fatigue. The elevation and cold temperature sapped our energy but did not damper our spirits. 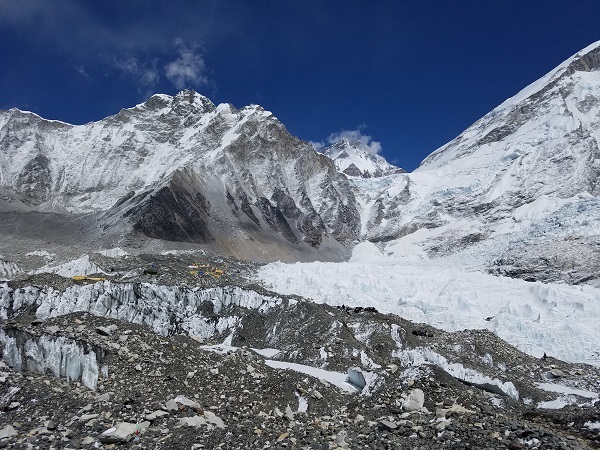 EBC was unremarkable except for the Khumbu Glacier and tiny yellow tents of the teams preparing for the summit push in May. There was a crystal blue sky which enhanced the view but understandably could be lost when the sky was cloudy. From EBC, one cannot see the summit of Mt. Everest and must hike through the Khumbu Icefall or summit Kala Patthar. Because the summit teams do not want anyone to introduce a contagious bug, we were not allowed in the immediate camp sites of the summit climbers; a common cold can become life-threatening at extreme altitudes. 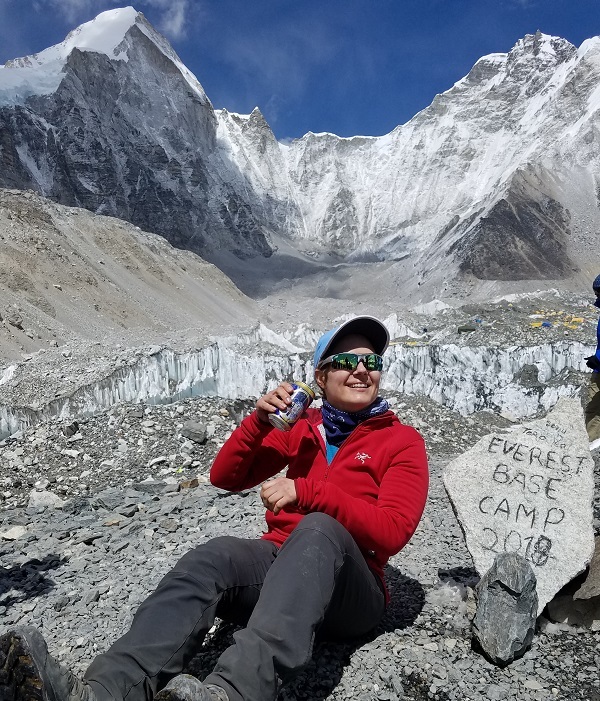 Due to bronchitis, Michele stayed for only a few photos: a group photo (which has not been emailed to the group yet) and a silly drinking “Everest beer on Mt. Everest” photo; she was escorted down to Gorak Shep to rest and recover. (Everest beer is a Nepali brewed pale ale.) Frederike stayed at EBC with the rest of the group and enjoyed the magnificent mountains and glacier. Our team at Everest Base Camp - We made it! 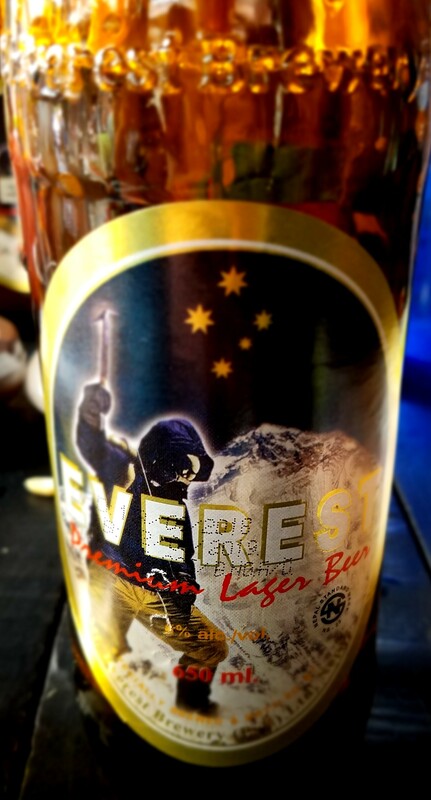 Everest has its own beer! 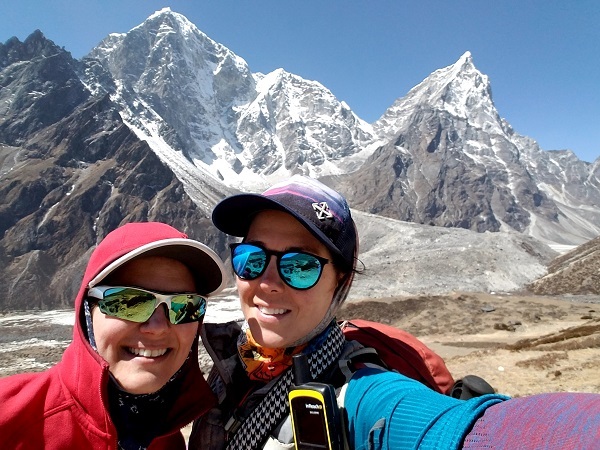 After resting for the night, Frederike and most of the team reached the summit of Kala Patthar (18,200 ft). 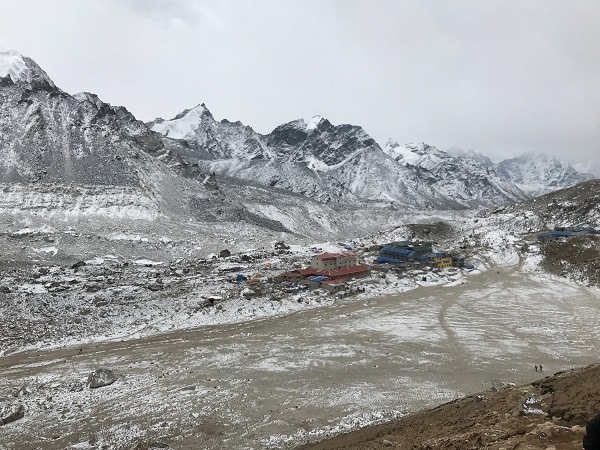 Frederike was disappointed that the views of Mount Everest and the Khumbu Glacier were obscured by clouds but was able to view Gorak Shep. 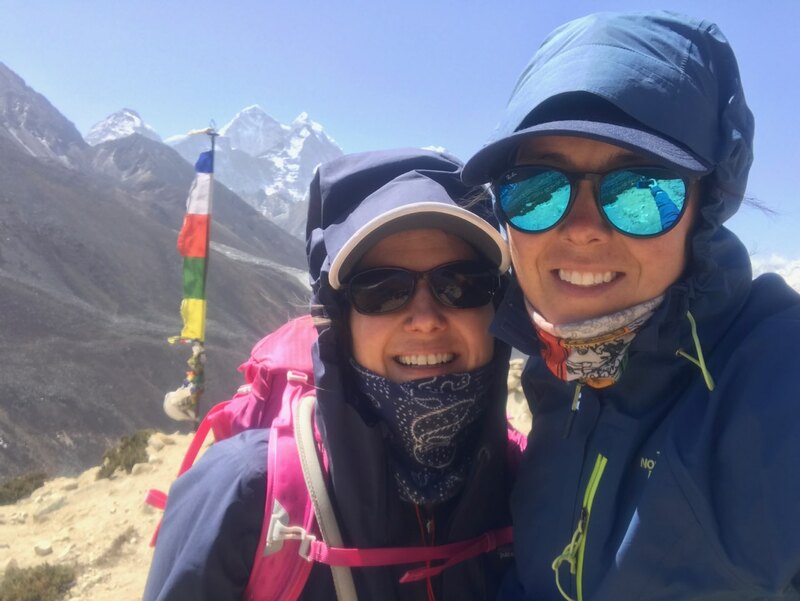 Michele and two other trekkers, who were not physically capable of reaching the summit of Kala Patthar, descended to Pheriche. As we were descending from EBC, we saw numerous gear (International Mountain Guides, Adventure Consultants, etc.) on yaks heading to EBC for May summit attempts. We descended rapidly from EBC to Pheriche to Debuche to Namche Bazaar via Tengboche monastery. 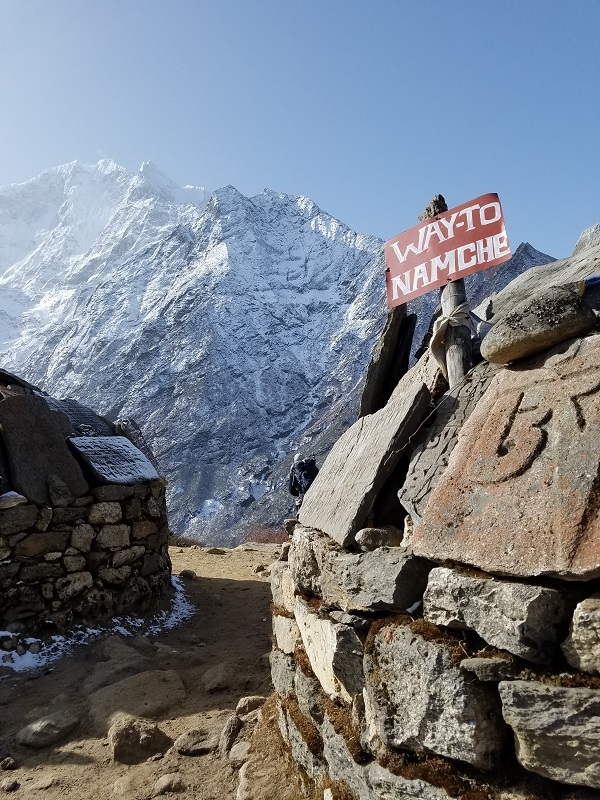 From Namche Bazaar, we hiked down to Phakding, and the next day returned to Lukla, where we concluded our EBC journey. While this was an exciting trip and Bucket List item, it is not without risk. Physiological stress was commonplace as everyone was affected by altitude at one point or another. There was also psychological stress from lack of sleep, fatigue, dehydration, lack of appetite, and being in a large group of ten. You test the strength and trust of yourself and your friendships, coming back with much more than you started with. Yes, originally, we mentioned eleven in the group. Unfortunately, one member of the group developed pulmonary edema and was airlifted off the trail and down to Kathmandu. Altitude sickness can happen to anyone even if they have been to higher altitudes previously. The Diamox helps prevent cerebral edema but the only cure for altitude sickness or pulmonary/cerebral edema is descent. Due to pollution and construction in Kathmandu, we got sick, each at different times during the trip with bronchitis, sinusitis, and Khumbu cough (high altitude bronchitis). This trip truly tested our physical and mental boundaries; it is not for the faint of heart—literally. We had the best and most challenging time of our lives. We arrived back to Kathmandu, stronger personally and within our friendship. How can you not, after sharing a tent without a proper shower in 16 days?! How does one top EBC trek? We’re not sure. Wait until 2020 to find out. Michele moved to Yakima from North Carolina several years ago with a desire to explore the great outdoors. She chose Yakima because it is close enough to the Cascades and bigger cities of Seattle, Portland, and Spokane, yet retains a small town feel to it. Although she grew up alpine skiing, Michele did not ski for nearly 25 years, and only began to ski again when she discovered White Pass. Located about an hour outside of Yakima, White Pass not only has beautiful views of Mount Rainier, it has varying terrain for all levels of skiers and is rarely crowded. The staff are very friendly and helpful, and the local skiers are equally friendly on the mountain and in the nordic park. Michele is looking forward to honing her alpine and nordic ski skills this winter at White Pass. Frederike moved to Yakima from Bend, Oregon. Living in the Pacific Northwest for 15 years, she enjoys all things outdoors. A former rock climber, white-water rafting, kayaking, and skiing are among her current passions. She enjoys running in relays, cycling and hiking in the spring, summer and fall. She, too, can be found on the slopes in the wintertime and will be taking avalanche safety courses to prepare for new alpine touring adventures. While she has been to many major ski resorts, she is drawn to White Pass for the same reasons she has stayed working in Yakima – the local vibes and community feel in addition to the accessibility and diversity of the mountains in this region. White Pass can be enjoyed year round!